Never mind all that Yorkshire nonsense, I want to know what Buddy Curtess & The Grasshoppers tracks you’ve got. All of em. Japanese editions too for all the bonus tracks. Cool review of this show HMO! Is Warrrior on it? 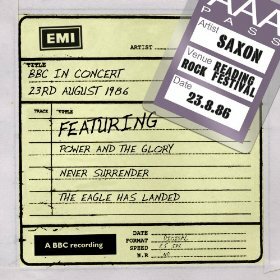 I see Power And Glory is….these were the good Ol days of music! Bonus points are awarded for you saying that Steve Dawson commands the stage…he always reminded me of a plumber for some reason!! Plumber eh? I guess it must be the Mario Bros tache? Yeah, I quite liked the first GTR album, at the time. Will have to check out Glockers work there. Interesting. I don’t think he actually played on the GTR album… I think Glockler’s gig with GTR was just as the live drummer so I’m not sure if he made it on to any records with them. (spoiler alert!) He was back in Saxon fairly soon anyway! Saxon! Right on. Live! Even better! Do you suppose they were trying on the pop thing just to see if it would take off? I mean, if they’re already established as a metal band, why bother? Hm. TELL US THE STORY, HMO! It’s pure conjecture but I reckon they probably just wanted more sales. Wanted to get into that Def Leppard/Box Jovi league. They always had a way with a melody so I can see how they might have thought “we can do that”. By all accounts though, they did get a lot of pressure to go in that direction from their management and label. Oy. That’s unfortunate. Metal can be melodic. There are already enough Bon Jovis in this world (one is enough). From what I read these days, one is probably too many! You’re absolutely right. Even being rather drunk didn’t help at all. I’m fairly certain I have that BBC sessions album … need to double check that. This 9 track deal sounds like a mighty fine selection, though. Other than the pop rock shenanigans among a bunch of monsters, of course. I still haven’t listened to much of the bonus stuff on the reissues … need to make a point of doing that! I’d have bought a ticket for Day Three. Yeah. It would be worth the globe-spanning trip just to see Dumpy! Cardiacs would have had my attention on that day. Some progressive nutter awesomeness, imo. I’ve watched some of their vids from the last 3 years on youtube. Dig it. 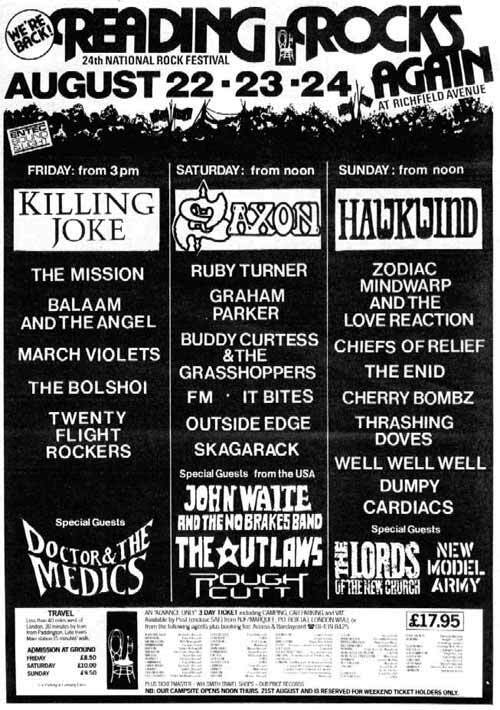 I liked bands with all sorts of images back then. I guess the bottom line with image, or an anti-image like Metallica had, is – is it cool? And in that regard, I’m not sure Saxon ever were! Back in the early days they were uncool but at least themselves… and fairly lovable. But when they started trying to look like glam stars they lost even that authenticity and lovableness. I think their image for a while was pretty toxic for them. If you saw a pic of them in a mag in the late 80s you did not want to get into that band! So if I have this straight, BBC broadcast 9 songs which is this CD now. But the rest of the set is also out there in a compilation? Is that right? I love BBC recordings for the sheer raw sound. This 9 song version isn’t available physically. It’s just a download. The BBC Sessions one came out a while back but its out of print now and only had 6 of the Reading songs on it. No full 9 song CD? Download only? The hell you say! Yup. And the 6 songs on the BBC Sessions CD are on this too, it’s not extra songs on that. This is the most complete version available. I gonna sound like a broken record but I should do prefer a CD release. You could tack those 3 songs on a bonus tracks on the BBC Sessions too. I’d prefer a CD too but it doesn’t exist so download it is!